I was out shooting it with a couple of good friends of mine. It was kind of a bachelor party shooting day. 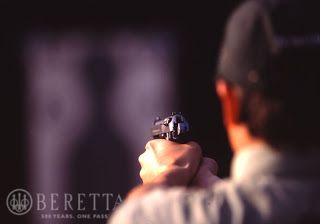 When I fired my first-ever shot of my Beretta 92FS. I was in love right away. The round hit exactly where I was aiming. The target was about 15 yards away. It was at a farm where there was a pile of dirt above a hole for landfill. There was a white flat piece of cardboard almost to the top of the berm. Don’t know why or how it was there. But it was a perfect object to shoot my first round at. It seems childish, I know. I was so excited to shoot my Beretta for my first time that I couldn’t wait to put up any targets. So I shot at the first thing I could find. And I couldn’t believe how well it shot. You just got to love the gun when it hits bullseye for your very first shot with it. After that, we set up a couple of shooting challenges. One friend had his 9mm and I had mine. We lined up spent 12 gauge shot gun shells along the ground about 7 yards away. Each had 10 to shoot. Whoever hit all 10 first would win. It was as if I couldn’t miss. We then put one shell in the center. 21 shells total. Each shot 10 to hit the one in the middle. That was so much fun, that I shot about all the ammo I brought just doing that. This gun is just all out fun!